We made a collaborative Rube Goldberg Machine! We demonstrated it live on the streets of San Francisco! Everyone knows these machine where a rolling marble tips over book, that sets a toy car in motion, that hits the on-button of a fan that blows away ... etcetera: a Rube Goldberg machine. Named after the cartoonist Rube Goldberg who made drawings of overly complex machines that performed simple tasks. I have always wanted to build a Rube Goldberg Machine. So when Sheila asked what I would be presenting in the water-science pop-ups that she organizes at the American Geophysical Unions (AGU) Fall Meeting in San Francisco, I said that I would build a water based Rube-Goldberg-Machine. Even better: I would invite makers and scientists to contribute parts of that Rube Goldberg Machine and we put it all together when we are at the meeting. The water cycle is an elegant simple truth about how water is pumped around the earth, but the water cycle is made up of very complex parts. A Rube Goldberg Machine is an ideal metaphor for the water cycle. 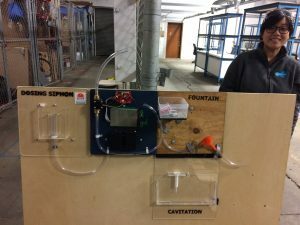 Together with fellow maker and earth scientist Pete Marchetto from UMN I constructed a rule-set: Everyone can make a 1' x 1' tile that accepts water from above and delivers it below. It must have mounting holes, so we can easily connect it to a board. Work In Progress at the Techschop in San Francisco: Hanna and the first four tiles. In total we got ten tiles, contributed by teams from UMN, TU Delft, OSU and Grady Hillhouse of the practical Engineering youtube channel. The three hectic days leading up to the demonstration Hanna and I (Pete was unfortunately sick back at home in Minnesota) feverishly put everything together and we made it just in time! Lisa Strong, a video producer telling stories about science, nature and history, volunteered to be our camerawoman and she made an awesome recording that was live broadcasted using Periscope into the conference center. Afterwards I added a close up and an endscreen and uploaded the demonstration to youtube, which I posted above this blog. This was awesome and I hope to do something like this again at another conference.